The difference between U.S. export prices for soybeans and Brazilian exports is narrowing, a signal that the market may be seeing some signs that progress could be made in U.S.-China trade relations, according to Citigroup commodities analysts. President Donald Trump and China President Xi Jinping meet on the sidelines of G20, which starts Nov. 30, and the market could be expecting some progress on the trade front. The soybean market is far more optimistic for trade progress than other markets, including equities. Soybean prices may be signaling some optimism about trade, ahead of President Donald Trump's meeting at the G20 with Chinese President Xi Jinping. According to Citigroup strategists, the measure to watch is the price differential between U.S. Gulf Coast soybeans for export and currency-adjusted export prices at major Brazilian ports. That differential has been narrowing, and that suggests the market may be expecting some positive development for U.S. farmers on the trade front. 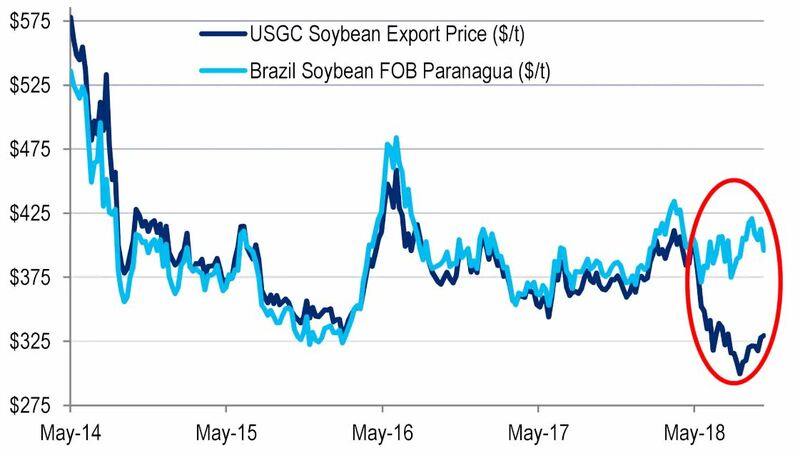 "Narrowing US-Brazil soybean price differentials imply greater market optimism on the potential for a Trump-Xi trade deal or at least a de-escalation of US-Sino trade tensions in advance of the G20. This positive sentiment stands somewhat in contrast to other asset markets, including equities," the Citi strategists wrote. Even with the 25 percent tariff on U.S. soy beans, the average soy price differentials have shifted from a 24 percent U.S. Gulf Coast discount to Paranagua in mid-October, to a 17 percent discount last week and 13-15 percent discount this week. The strategists said the differential could partly account for any movement of U.S. beans to South America for local crushing or even re-export. "We think it is mostly a reflection of the physical trade becoming more optimistic about a 'surprise' breakthrough for US-China trade relations. Indeed, Brazil premiums to CBOT futures have also collapsed, from over 250 cents to below 200 cents over this period while soybean prices in Brazil for delivery into China have also fallen in both US$ and BRL terms," they wrote. They also note that options traders on the CBOT seem more optimistic about U.S.-China trade and are factoring it in to prices. Soybean futures Wednesday were up 0.5 percent at $8.82 per bushel. "A quick resolution of the US-China trade war could send prices above $9.25/bu, in our view," they wrote.